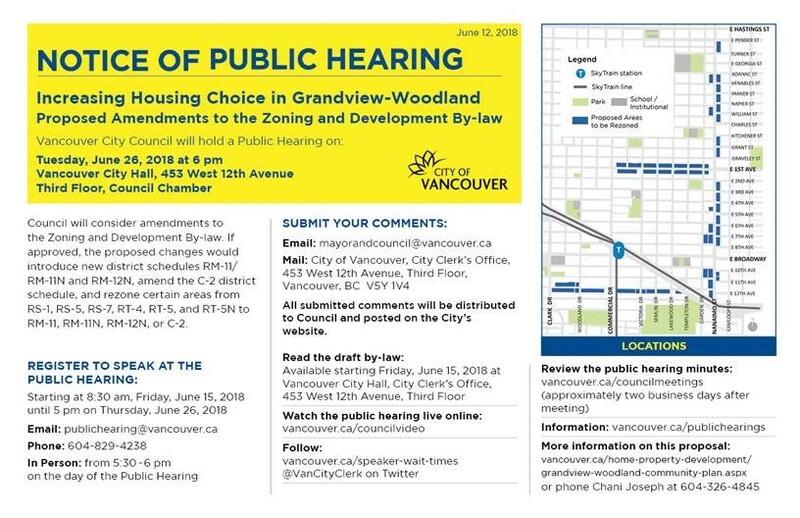 The public hearing for the “Increasing Housing Choice” rezoning in Grandview has been set for Tuesday 26 June at 6:00pm at City Hall. To repeat what I have written before, I approve the addition of a lot more multi-family buildings in Grandview. However, unless we guarantee through regulation that they can be afforded by the median income family in Vancouver, then let us not kid ourselves that this is helping the affordability crisis. As I showed in my short video of some months back, these kinds of market developments are not only unaffordable to the majority, they often destroy currently affordable accommodation. If you are in the mood, sign up for a speaking spot and enjoy your five minutes (no more) of face-time with City Council. This entry was posted on Wednesday, June 13th, 2018 at 10:56 am and is filed under Community Plan, Other Writings. You can follow any responses to this entry through the RSS 2.0 feed. You can leave a response, or trackback from your own site.